Tesla CEO Elon Musk says a lot of bold things. But he may have just outdone himself. He thinks the stock will go into "insane mode" over the next decade. Musk told investors on the company's earnings conference call Wednesday evening that Tesla (TSLA) could be worth $700 billion by 2025. 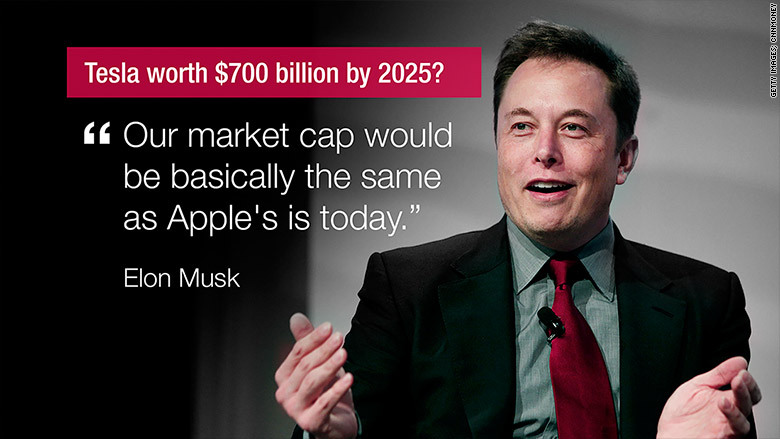 In other words, Tesla could eventually be as valuable as Apple (AAPL) is right now. Never mind that Apple just became the first U.S. company worth that whopping valuation. Musk made the prediction in response to a question about capital spending plans. Tesla is currently worth about $25 billion. The optimism from Musk is even more shocking since Tesla's stock plunged 5% Thursday after the company reported a surprise loss and lower sales than expected. Shares are now more than 30% below their all-time high. Musk's math. So why does Musk think the stock could surge 2,700% in the next decade? He bases his $700 billion valuation estimate on a couple of assumptions. First, he thinks that the company can continue to report sales increases of 50% a year for the next decade. Related: What will the car of the future look like? 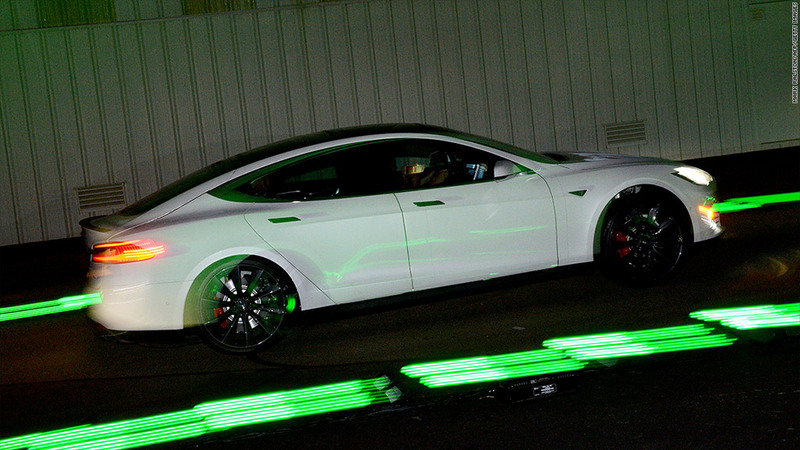 Analysts are expecting Tesla to report $6 billion in revenue this year. Do the math and 50% a year would get Tesla to annual revenue of $346 billion by 2025. Musk added that he thinks Tesla's profit margins could be 10%. That works out to $34.6 billion. He then said that Tesla could merit a valuation of 20 times its annual profits. That gets you to a $692 billion market value. Musk conceded that these are "back of the envelope" calculations. But he's confident that he'll be right. "I'm not saying they're true or that they will occur, but I bet that they do occur," he said. But is Musk's math realistic? Can Tesla really report 50% revenue growth a year for ten years? That seems like a stretch. Too many risks. The growth rates of all companies eventually begin to slow over time, especially as they grow larger. It happened at Apple and is happening at Google (GOOGL) and Facebook (FB). That's not a bad thing. It's just reality. It's also unclear why Musk chose a multiple of 20 times earnings for his calculations. Of course, that's a lot lower than the current Tesla valuation of more than 110 times 2015 profit forecasts, but 20 times earnings is significantly higher than the price for traditional auto companies GM (GM), Ford (F), Fiat Chrysler (FCAU), Toyota (TM) and Honda (HMC). It's also more expensive than Apple, which is valued at 15 times estimates. For Tesla to get to nearly $350 billion in annual sales, it would need to sell millions of cars a year -- not tens of thousands. To do that, everything has to go right for Tesla. The new Model X crossover will need to be a hit. Related: Time to ditch Tesla stock? It will have to get its big gigafactory running on schedule so it can make more batteries for its upcoming Model III vehicle. That's the car that Tesla hopes to sell at a more affordable price in order to become a more mainstream auto company. 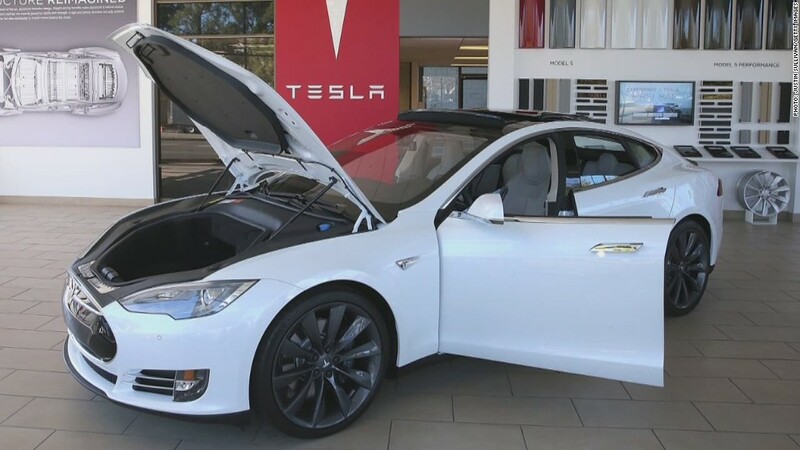 The Model S is a high-end luxury brand, selling for nearly $70,000. Tesla also has to figure out China. A stumble there was one of the reasons the fourth quarter numbers were considered a disappointment. And it's not as if GM and others are going to throw in the towel on electric cars. Finally, Tesla has to hope that gas prices don't remain this low for a long stretch. Related: Why is Fidelity investing in SpaceX? Tesla's stock price has slid along with oil prices, and some analysts believe that demand for electric vehicles will never move beyond niche level unless consumers start to feel more pain at the pump again. Now I'm not trying to suggest that Tesla's stock is doomed. Betting against Musk has so far been unwise. The stock has gained more than 10,000% since going public in 2010. But Musk may be a little too optimistic. It's a bit of a surprise. Musk has said on numerous occasions that he was worried the stock may be ahead of itself. But now he's pulling a SpaceX and saying the stock could surge into the stratosphere.